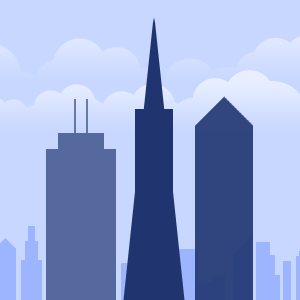 101 Second Street is an office tower located in the South of Market district in San Francisco, California on Mission Street. The 108 m (354 ft) building was completed in 1999 and has 26 floors with 388,000 sq ft (36,000 m) for offices. This is one out of several new highrise projects completed or under construction on Mission Street since 2000. 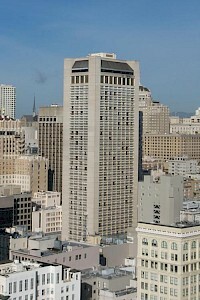 100 Montgomery Street also known as the Equitable Life Building is an office tower located in the Financial District of San Francisco, California. 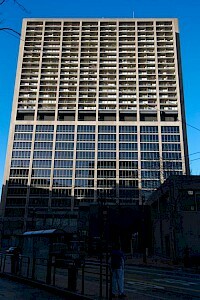 The 108 m (354 ft) 25-floor tower was completed in 1955, and served as headquarters to the Equitable Life Insurance Company. Designed by William Peugh, 100 Montgomery Street is one of the first post-World War II office buildings in San Francisco, distinguished by classical white marble facade against aluminum art-deco window framing. Regions Center (also referred to as the Regions Building) is a 108-meter (354-foot), 28-story skyscraper at 315 Deaderick Street in Nashville, Tennessee. It is the Tennessee headquarters of Regions Financial Corporation. 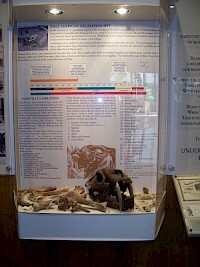 It was completed in 1974. It was originally called the First American Center but the name was changed when First American National Bank merged with AmSouth Bank. 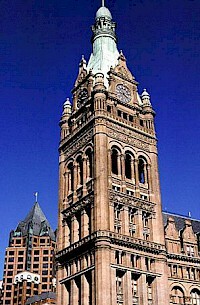 A major renovation of the building's ground-level exterior followed the name change. Fox Plaza is a 492 feet (150 m) high skyscraper with 35 floors in Century City, Los Angeles, California, a local landmark. Completed in 1987, the architects behind its design were Scott Johnson, Bill Fain and William L. Pereira. Owned by Orange County-based The Irvine Company, Fox Plaza is 20th Century Fox's headquarters. Former President of the United States Ronald Reagan occupied a penthouse on the 34th floor for several years after leaving public office. 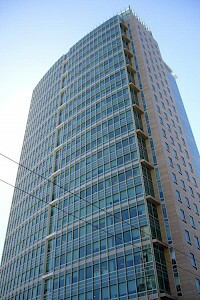 Archstone Fox Plaza is a 29-story building located at 1390 Market Street in the Civic Center area of San Francisco. Built in 1966, the tower stands 354 ft (108 m) on the site of the former historic Fox Theatre at 1350 Market, which was opened in June 1929 and demolished in 1963. The first twelve floors contain office space. Unlike many buildings, Fox Plaza has a 13th floor actually labeled "13", although this floor is the service floor and is not rented out.